Last week my husband and I saw a Dr. Christopher Mann. He's an orthopedic surgeon. I wanted to know what chances there are of my rod removal. Would bone need to be broken? Is something like this even done? Dr. Mann isn't a scoliosis surgeon, but he knew more than I about bone, and I wanted to hear his take. 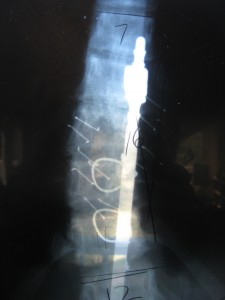 He thought that the wires connecting the rod to the spine were made of stainless steel, just like the rod. I was surprised to see that these 16 gauge luque wires were simply twisted closed, like twisty-ties around food bags. Getting the rod out wouldn't be the problem, he said. That could probably be screwed out out from the top and bottom screws and lifted out. 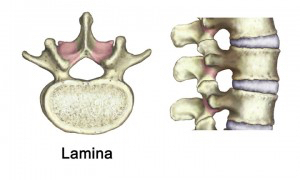 But since the wires are hooked into and looped around the lamina, they are right next to the spinal cord and the nerves. If you even slightly tapped the cord, you risk paralysis. Additionally, bone might have grown around the wires, since this Harrington rod surgery was done 28 years ago. Dr. Mann strongly advised NOT to remove the rod. On the plus side, he thought that this type of surgery was a very effective way to treat scoliosis, even back then. And as to my concerns about metal ions floating around my body and doing god knows what, he said that it was nothing like metal on metal hip replacements. In those, the articulation of bone and socket cause an 'explosion' of metal ions, which is why they're no longer done. He said my stainless steel rod was inert, but also said he couldn't say zero corrosion. He also named another reason to not have surgery - there would be a (another) large incision, and there's always the risk of infection. Something else I'm glad to know about is that even if they could take the rod and wires and screws out, and all went well with surgery and I was sewn back up...could I then bend my spine? Answer: nope. Back in '84 they really did have to fuse the whole thing (from T3-L4) or else the spinal movement would have broken the rod. So, fantasy images I have of myself doing yoga with a flexible spine - dashed. Since Mann isn't a scoliosis surgeon, I don't consider this the final no. If I wanted to pursue it, I'd drive two hours to someone who does rod removal for their opinion. But for now, rod removal is on the (back) back-burner. Jun 7 SC Johnson's "Fragrance Palette"